100 Montaditos of the West Vilage shares their recipe for a staple Spanish dish, Tortilla Espanola. As referred to as a Spanish omelette, the basic version is made with fresh eggs, starchy potatoes, and onions. The potatoes and onions are first fried in olive oil, then drained and mixed with eggs, before returning to the pan to be fried again. This dish makes a great appetizer, can be served as a tapa, or be part of a main dish. 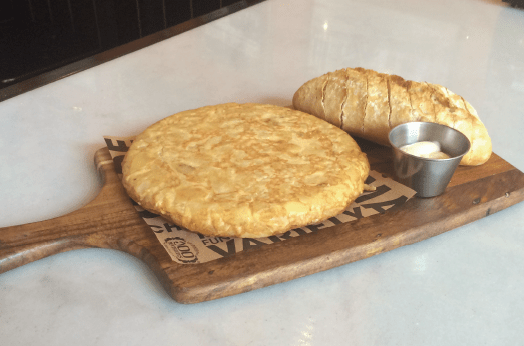 The Tortilla Espanola is a new item on their menu at 100 Montaditos, and below is a recipe for their own version of the dish. It would be a nice dish to prepare for your next dinner party or gathering, or stop by the restaurant and enjoy it there. Peel the potatoes and leave them soaking in water for 10 minutes. Meanwhile, pour enough olive oil into a large saucepan so it’s about an inch deep. Heat over medium heat until a slice of onion bubbles gently when placed in the oil, about 310 degrees F.
Add the onions and fry, stirring occasionally until just golden, about 8 minutes. Scoop the onions from the oil with a slotted spoon and drain on a paper-towel lined baking sheet. Add about half of the potatoes, and fry until lightly golden and little puffy, about 10 minutes. Scoop the potatoes from the oil, add the onions and repeat with the rest of the potatoes. Season with 3 teaspoons of salt. Break the eggs into a large bowl. Whisk just enough to combine but not so much that they get loose and runny, about 15 minutes. Add the potatoes and onions to the egg. Heat a medium (10-inch) nonstick skillet over medium heat. Add 2 tablespoons of the reserved oil and heat. Add the tortilla mixture and stir briskly with a spatula to get peaks and valleys in the folds of the egg, about 2 to 3 minutes. Stop stirring and reduce the heat to low, and cook until the eggs are set but still pretty loose, about 5 minutes. Lay a flat pan lid or a plate on top and invert the tortilla. Add more oil to the pan if needed, and slide the tortilla back into the pan and finish cooking until set and lightly brown, about 3 minutes more. Slide the tortilla out of the pan to a cutting board to cool slightly. Cut into cubes or thin wedges and serve warm or room temperature.